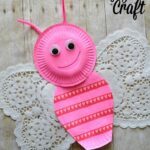 Boy do I have a fun craft for you today! 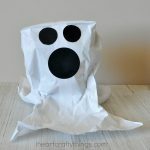 This paper plate spider web craft is super simple to make and is perfect as a playful Halloween craft. 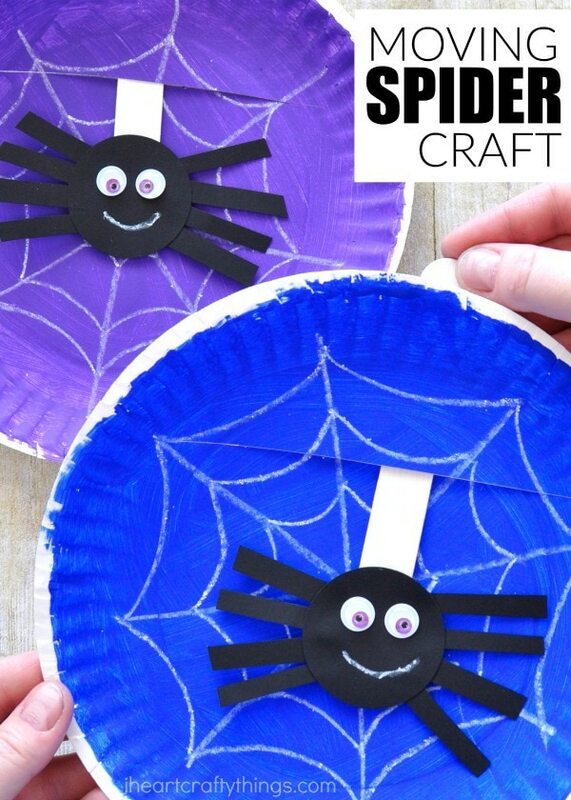 You could also make this fun spider web craft any time of the year after learning about spiders or to go along with a favorite spider-themed children’s book. Preschoolers might also enjoy playing with this craft while singing Itsy Bitsy Spider. So many fun possibilities! 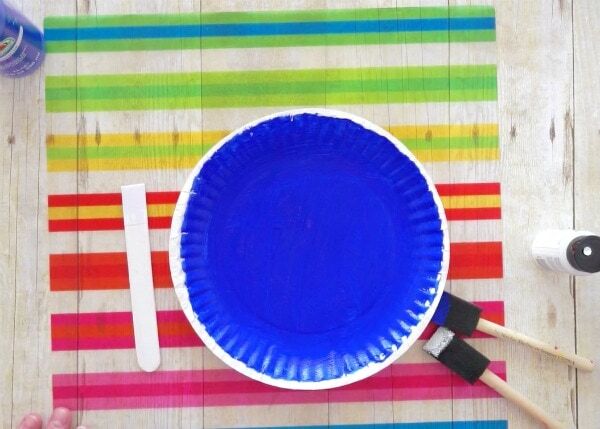 1- Paint your paper plate with your blue or purple paint, or a dark color of your choice. Paint your adhesive jumbo craft stick with white paint. Let the paint dry completely. 2. While your paint dries, cut out a 2-inch circle from your black cardstock. Then cut out 8 spider legs from your black cardstock. 3. Glue the spider legs onto the 2-inch black circle. 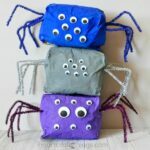 Glue googly eyes on the front of your spider and then use your white crayon to draw a friendly smile on your paper spider. 4. When your paint has finished drying, draw a spider web onto your paper plate with your white crayon. To do this draw a white line down the middle of your paper plate. Then turn your paper plate 90 degrees and draw another white line down the middle of the paper plate again. Then draw two diagonal lines through the existing lines you drew intersecting them all in the middle of the paper plate. 5. 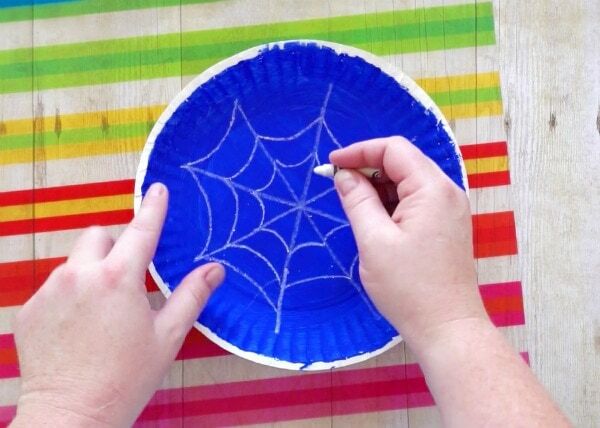 Draw curved lines between each of the intersecting lines to finish making your spider web craft on your paper plate. 6. 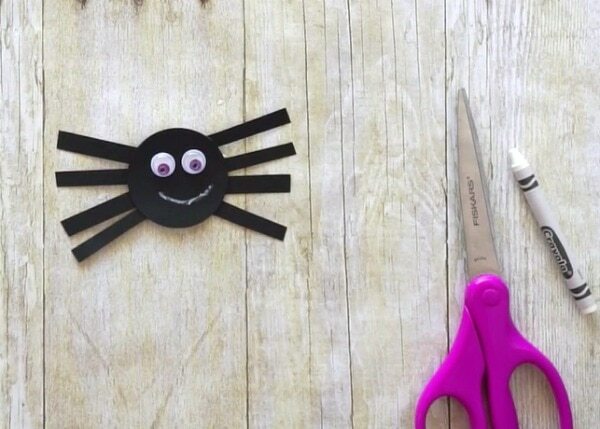 Remove the adhesive backing from your jumbo craft stick and attach it to your paper spider. You’ll want the paper spider to sit at the bottom of the jumbo craft stick (see picture below). 7. 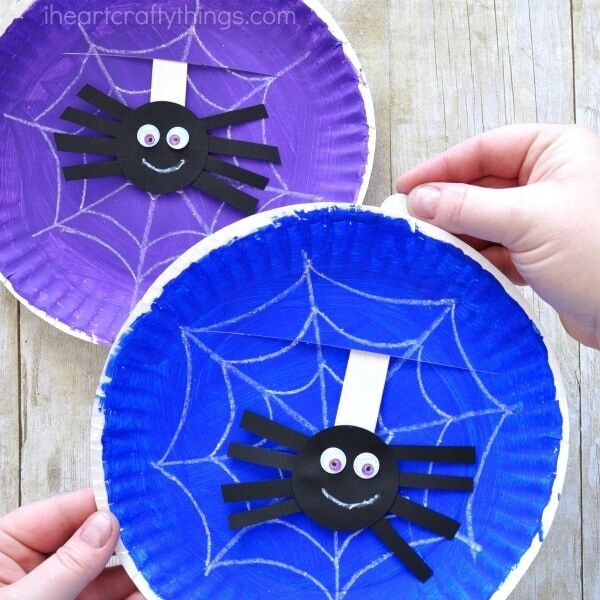 Use a craft knife (adult use only) to cut a slit at the top of your paper plate spider web craft. 8. Poke your jumbo craft stick with the spider at the bottom up through the slit in the top of your paper plate. Your spider web craft is completed! Now it’s time for play! Hold your paper plate in place with one of your hands and then use your other hand to hold the jumbo craft stick at the top of the paper plate. Move the jumbo craft stick up and down and around and watch your spider move around inside his web. Did you love this playful spider web craft? If so, you’ll love more our interactive Halloween paper plate crafts like this paper plate witch craft or our flying bat craft. 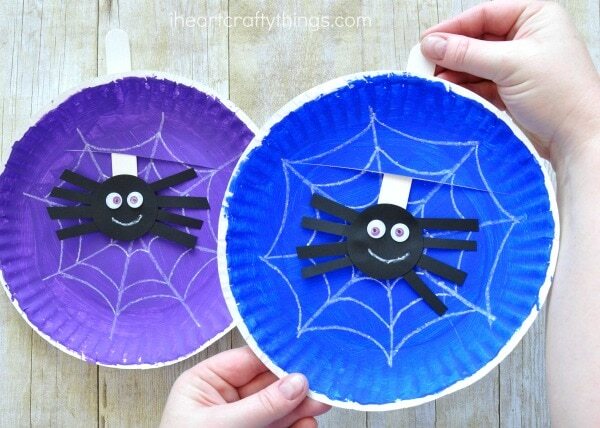 These paper plate spiders are always a huge hit for Halloween too.